WestConnex will provide 33km of motorway to link western and south-western Sydney with the city, Kingsford Smith Airport and Port Botany precincts. It will largely be constructed in the M4 and M5 corridors and will comprise approximately 14km of road above ground and approximately 19km of tunnels, including a new tunnel linking the two corridors. Stage 1A, M4 Widening (Parramatta to Homebush) - widening the existing M4 Motorway from Parramatta to Homebush. Stage 1B, M4 East (Homebush to Haberfield) - extending the M4 Motorway in tunnels between Homebush and Haberfield via Concord. Includes provision for the future connection to M4-M5 Link. The New M5 (Beverly Hills to St Peters) – duplicating the M5 East from King Georges Road in Beverly Hills with tunnels from Kingsgrove to a new interchange at St Peters. The St Peters Interchange allows for connections to the Sydney Gateway. The New M5 tunnels include provision for a future connection to the M4-M5 Link. King Georges Road Interchange Upgrade (Beverly Hills) – upgrade of the King Georges Road Interchange between the newly widened M5 West and the M5 East at Beverly Hills, in preparation for the New M5. 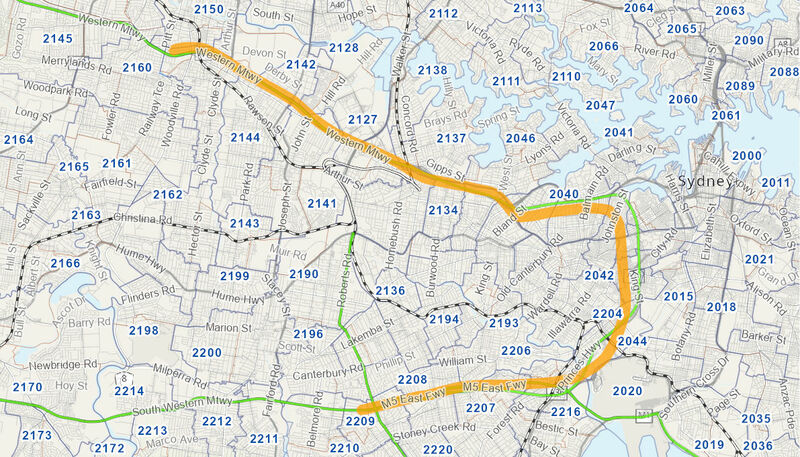 M4-M5 Link (Haberfield to St Peters) – tunnel connection to the M4 East and New M5 via Rozelle and Camperdown. Includes ramps connecting to the St Peters Interchange and an interchange at Rozelle with provision for a future connection to the Western Harbour Tunnel. It also includes an underground tunnel from the Rozelle Interchange to Victoria Road near Iron Cove Bridge, known as the 'Iron Cove Link'. WestConnex will also create opportunities for urban renewal, improved liveability and public and active transport improvements along and around Parramatta Road. WestConnex is expected to create around 10,000 jobs during construction. delivering more than $20 billion in economic benefits to NSW. On 7 March 2013, the Australian Government provided $25 million to assist the NSW Government to advance planning and develop a business case for WestConnex. The NSW Government provided $30 million for this purpose. The Australian Government has committed $1.5 billion in funding to deliver WestConnex in partnership with the NSW Government. The Australian Government is also providing a concessional loan of $2 billion to accelerate delivery of the New M5. This innovative financing model is enabling Stage 1 and Stage 2 of WestConnex to be delivered concurrently, enabling the New M5 to be delivered at the same time as the widened and extended M4. It has also helped unlock private sector expertise and ensure that maximum value is achieved from taxpayer dollars. Construction commenced in March 2015 and the Widened M4 opened to traffic in July 2017. Tunnelling commenced in July 2016 and the M4 East is expected to be opened to traffic in mid 2019. In June 2015 the consortium of Leighton Contractors, Samsung C&T and John Holland was awarded the preferred design and construction contract for the M4 East tunnels and related connections. The Environmental Impact Statement was on public display for comment in November 2015 and planning approval was granted on 12 February 2016. Construction work commenced in July 2016 and tunnelling in November 2016. The New M5 will be open to traffic in early 2020. In September 2015 the Leighton Dragados Samsung Joint Venture was selected as the preferred tenderer for the New M5. The Environmental Impact Statement was on public display in December 2015 and January 2016. State planning approval was granted on 20 April 2016. Approval under the Commonwealth Environment Protection and Biodiversity Conservation Act 1999 was granted on 11 July 2016. Construction commenced in July 2015 on the interchange upgrade, which opened to traffic in December 2016. On 11 May 2015, a construction contract was awarded to Fulton Hogan Construction for the upgrade. Planning approval for the interchange was granted on 3 March 2015. The final stage of WestConnex is in the early planning stages. Construction commenced in 2018 and open to traffic in 2023. The concept design was released for community feedback in May 2017. The Environmental Impact Statement was on public exhibition for 60 days between 18 August and 16 October 2017. The Submissions and Preferred Infrastructure Report was submitted to the NSW Department of Planning and Environment on 5 February 2018. On 27 April 2018, the NSW Minister for Planning announced planning approval for the M4-M5 Link.